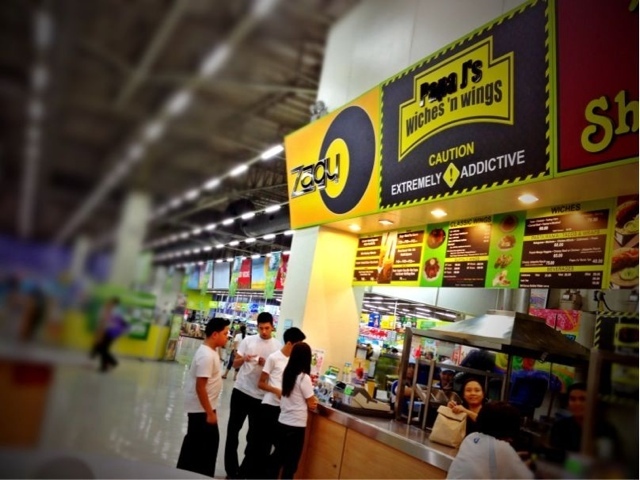 After doing our weekly grocery at SM Hypermarket, Shaw Mandaluyong branch the other day, we stopped by their food court area to check out what to eat. 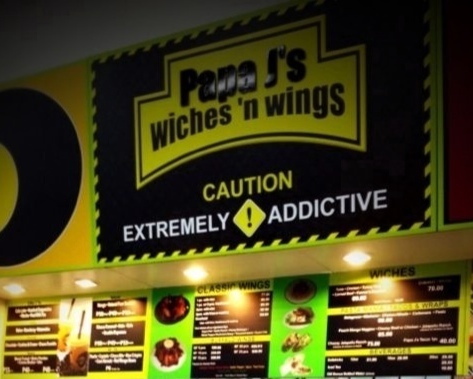 This newly opened stall called “Papa J’s Wiches ‘n Wings” caught my husband’s attention. 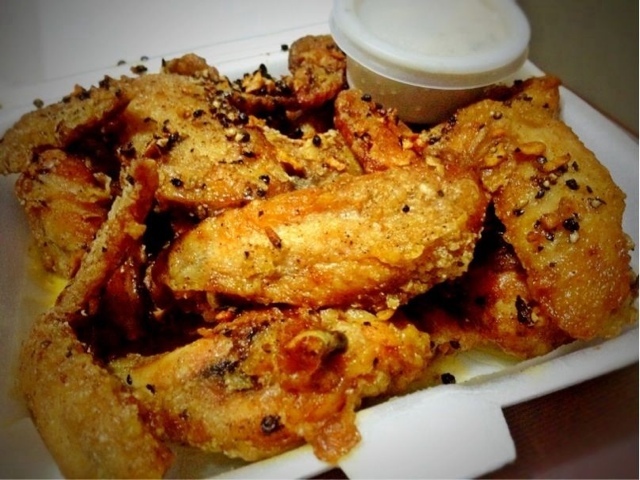 He ordered 5pieces Garlic Pepper Buffalo Wings for Php120.00. To his surprise, it was really really good! So good that even while his mouth was on fire because of the chicken’s spicy mix, he gobbled everything clean in less than 10 minutes. It happened so fast I wasn’t able to get a picture of it! 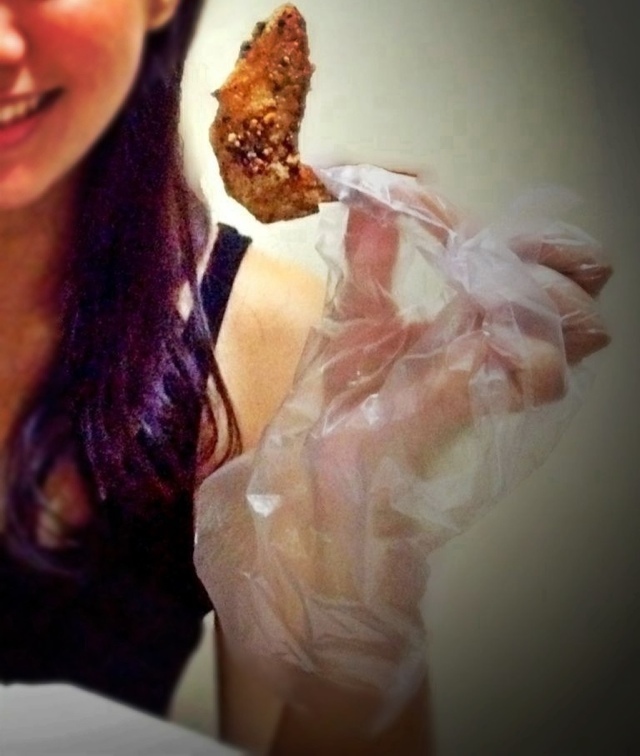 So, I ordered an extra 10pieces of the same dish (Garlic Pepper Buffalo Wings) for Php220.00 to take home. Let’s see if the stall’s, “CAUTION: EXTREMELY ADDICTIVE” notice is indeed true! This is my order – 10pieces Garlic Pepper Buffalo Wings. It comes with plastic gloves as it is better to eat using your hands. I kid you not, it is really extremely addictive! It was crispy, flavorful and immensely spicy! The flavors were evenly spread in every part of the chicken – yummy even if you eat its meat and skin separately. Their garlic ranch dip perfectly compliments the wings. The chicken wings were cooked and topped with generous amounts of toasted garlic and pepper. If you love spicy food, you have got to try this! If Garlic Pepper Spicy flavor isn’t your thing, you can also choose from among their other offerings: Nuclear Threat, Atomic Blast and Thai Fever.